Remember when I said leopard print seemed like too much? Well, perhaps this new sweater from Rose Wholesale changed my mind. The white and black colors make it a more crisp neutral that was easily mixed with my leather leggings and chambray button down. Plus, did you see how it has pockets?? Anything with pockets is instantly made 10x better just because of that! I'm wearing my cut out boots again, because honestly, I can't get enough of them. They're my new favorite pair! I'll have to show you how I've worn them with my skirts and dresses eventually. As the days warm up, I have to look at my collection of black boots and sigh sadly over their impending farewell. Once summer hits, it's going to be all about the sandals and open toe shoes! Better enjoy your boots while you can ladies. I don't know about where you live, but my feet get all gross and sweaty if I try to keep them confined in boots during summer months. Aaaanyway, enough about foot sweat. If you're curious what it's like working at a coffee shop, let me tell you. Seriously, if you're waiting in a drive-thru line and you peer through the window, you'd see baristas whizzing through multiple drink orders, taking orders through their headsets, and simultaneously dealing with customers inside. I don't know how my coworkers do it so effortlessly! I've been put on the headset finally and am now helping take orders and run the drive-thru register, but I'm still learning what goes in drinks or how to ring up certain ones. More often than not I just feel like dead weight as everyone else whizzes about in a flurry of espresso beans. It's frustrating to say the least. There is SO MUCH TO LEARN! Whenever someone pulls up to the drive through, I almost hold my breath as I wait for their order. Will it be a complicated list of five drinks, all different with varying levels of extra espresso, skim milk, sugar free syrups, and extra whip? Or will it be an easy "Just a medium Milkee Way please"? Whenever I get those simple orders, I honestly feel like sending them a kiss through the speaker. While everyone has been incredibly patient, there's one girl in particular at work who has been super helpful and sympathetic, since she remembers more clearly how much of a struggle it is to get started there. When it was slow and we only had one or two drink orders she had me help in measuring syrups and make a few shots of espresso, so at least I got experience doing that! It's definitely a job that'll take a lot of time to adjust to, but I'm not too discouraged. I just know that I can learn this, and once I do, it'll be an amazing job! Besides...as many free coffees as I want during my shift, can you beat that? You are so gorgeous and your outfit so absolutely cool! There's nothing better than a good leopard shirt. Also loving your hair! I am not big fan of leopard print, too, but you made it so punk and cool. Great job girl! gah if i could get as many free coffees as i want i'd probably get super cracked out haha- TOO MANY. also, i can only imagine how stressful it is to learn all of those crazy drinks, it's great you found a friend that will help you :) and you styled that leopard so chicly- i LOVE it with those leggings. LOVE those buckle booties! SO cute! And as always, you're amazing at pulling off edgy looks :) My baby sister has been a barista for over a year now and had a hard time getting it all down at first too. But no worries, in no time you'll be pro! Your hair looks awesome in a pony tail and I love the details of all the elements of this look! Yes, MA'AM at this entire outfit!! 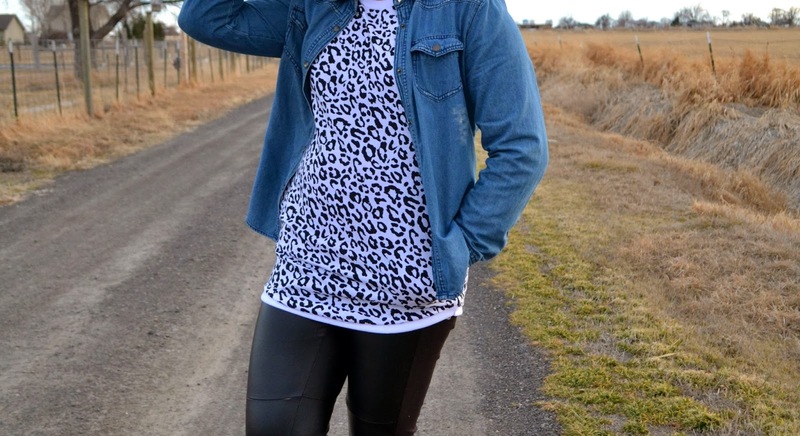 I didn't know I'd like leopard + leather so much until I saw this. It always seems "over the top" but this is really nice on you. Love this letter perfect outfit, it loos so great on you. I love leopard prints on you, and think, also. What one can do with a bit of espresso and your creativity!! Great black and white combo and the cut out booties are really cool. Ughmsdifsdfksd THIS OUTFIT! You are lookin' like a total babe here, Linda, if I may say. I really love your hair up in a ponytail like that, and your accessories are super trendy, especially dem snazzy little earrings. Linda, I can imagine! It's probably like studying for a course. HAHAHA There are so many variations to drinks. You use to be able to order just one thing, but now people want it tailored to them. I'm one of those simple people that order. HAHAHAHA Love your outfit. Love the denim with it. Let me just say that I know how crazy it is working in the hospitality industry. I've never worked at a cafe but worked in a pizza place and fast food chain when I was a teenager and now refuse to ever step foot in one of those places hahaha! Crazy is an understatement! Personally I like leopard. And I love the way you toned it down in this outfit. Great mix. Wow. the coffee world sounds incredibly complicated. I just use a Keurig. IT's a lifesaver. when it comes to your leopard sweatshirt I definitely like it. and like you said, it's not too much! but open toe shoes here where I live? maybe after a couple of months, haha. though I'm itching to wear flats or loafers for the first time after the snow and bigger cold. Great sweater, and I love your booties! You know what? 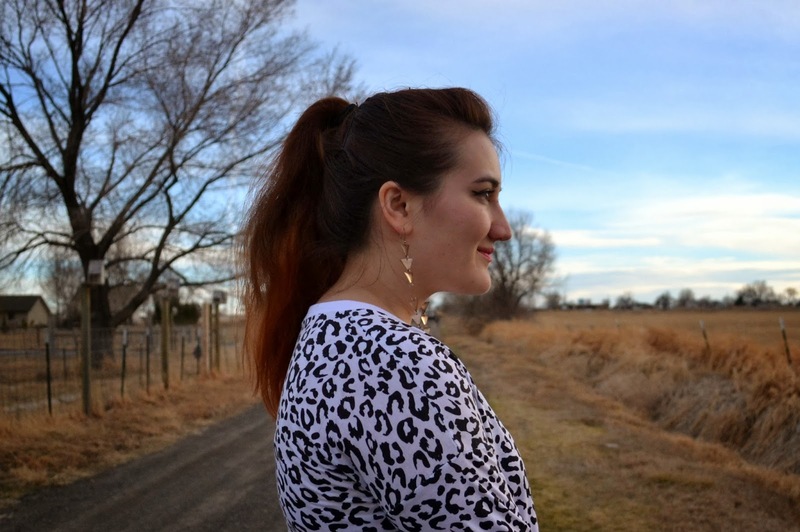 I had a white with black leopard top I wore in the summer and I decided to give it back to Savers, but the other day I was sorting that stuff and decided to keep it after all. So your ensemble would / could be replicated asap. oh oh. Hey thanks for loving my 'nerdy?' top. Nerdy is good, right? and you did a great job styling it too, you look fabulous! Oh, I love you hair like that! It looks so modern and just...cool :) Wow, it sounds like working in a coffee shop is no joke. It sounds like you're giving your very best effort, and I know you'll be whipping up non-fat, low-foam soy milk lattes in no time!